When I would tell both new and experienced hikers from my part of Virginia that I planned to hike the Big Draft Wilderness, the reaction was the same. "Where is that?" Most had never heard of it. Big Draft doesn't have the gravitas of the "bucket list" West Virginia wildernesses, like Dolly Sods or Cranberry. But, located just a few minutes north of White Sulphur Springs and Interstate 64 just over the Virginia/West Virginia border, it is probably the most accessible of all the West Virginia wilderness areas for hikers from Central Virginia. this one looks like someone left it in the dryer too long. My latest wilderness sign selfie features a personal size sign! Big Draft is the smallest of all current West Virginia wilderness areas. Big Draft is also a new wilderness, as it is was named to the system in 2009. It contains only a few trails, including one that I had wanted to check out for a long time - the Blue Bend Loop Trail. 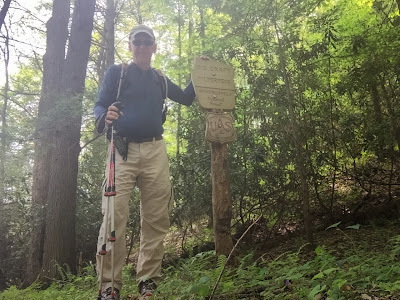 A weekend Boy Scout teaching obligation had me nearby in Covington, Virginia, so I extended the weekend by checking out this trail and one other to qualify another wilderness area for the Dirty Dozen Wilderness Hike Challenge,- my 13th completed wilderness area - my "Dirty Baker's Dozen" hike. Access to Big Draft Wilderness is from the Blue Bend Recreation Area, in the far south portion of the Monongahela National Forest. Blue Bend includes an exceptional campground, with 20 beautiful sites along Anthony Creek. The campground also has a CCC-era pavilion, flush toilets, and warm showers. Park in the day use area (no fee) and follow signs to a footbridge over Anthony Creek, which feeds into the Greenbrier River. On the other side of Anthony Creek, most folks will take a left, as it leads away from the wilderness border and towards a riverside beach. Trails are easily followed here, but not well marked. I went straight past a kiosk with a map, and that took me where I wanted to go - onto the Blue Bend Loop Trail, taking the loop clockwise. Every trail description I read before this hike described the trail in a counter-clockwise direction, which means taking the trail along Anthony Creek for about 1.5 level miles before climbing over Round Mountain. I wanted to front load my elevation gain, so I climbed the mountain first. I think the trail descriptions I saw recommended the opposite direction because I passed the three nice overlooks early in my hike. So within the first mile-and-a-quarter of my 12 mile hike, I'd already burned the best views of the entire day. Each overlook was in the same direction, and each was at a switchback when the trail was at the farthest east points in the loop. at switchbacks on the Blue Bend Loop Trail. I was interested to see the trail shelter that predated this area's establishment as a wilderness area. From the descriptions in trail guides I had read, I pictured this shelter sited along the trail when it was following a ridge, possibly with views to the south nearby. But it wasn't anything like that. Instead it was in a wooded area that dipped down from the rest of the trail, with no views to be found nearby. It was also in a sloped area, so there isn't much opportunity to camp nearby - limiting my interest as a boy scout destination. Trail shelter on the Blue Bend Loop Trail. camping around the trail shelter was not optimal. After the shelter, the trail wraps around the mountain, hugging sometimes steep slopes before descending to Anthony Creek. From here, I headed west on the Anthony Creek Trail. and the intersection with the Anthony Creek Trail. If you look at the elevation profile for this hike, you might think that I had completed the hard portion of the hike. After all, there is not more than about 120 feet elevation difference over the remaining 9 miles of my hike. But you need to look more closely at the chart. Every time I stop there is a little "blip" in the line - kind of like looking at tremors on an earthquake graph. So the portion of the hike coming down from the shelter had only one stop until I got to the bottom. Notice the number of blips after I get to the bottom. I was stopping all the time, and it wasn't to catch my breath. The stops were because the trail was blocked by a downed tree or downed vines. It was hard to get around many of them because the slope down to Anthony Creek was steep and stinging nettles were growing on the sides of the trail. 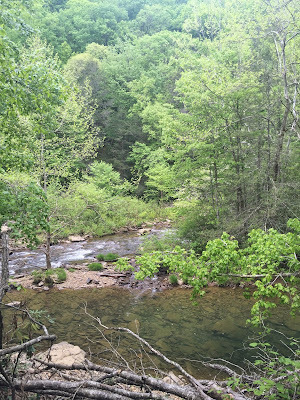 While the Anthony Creek Trail provided many nice views of Anthony Creek (along with an occasional fisherman in the water), I would have enjoyed more doing the loop trail twice. Anthony Creek from the eponymous trail. A trail's quality today is dependent in part on when it was last maintained. Perhaps if you take this same hike the trail will have been cleaned up and you will find this to be a delightful trail. 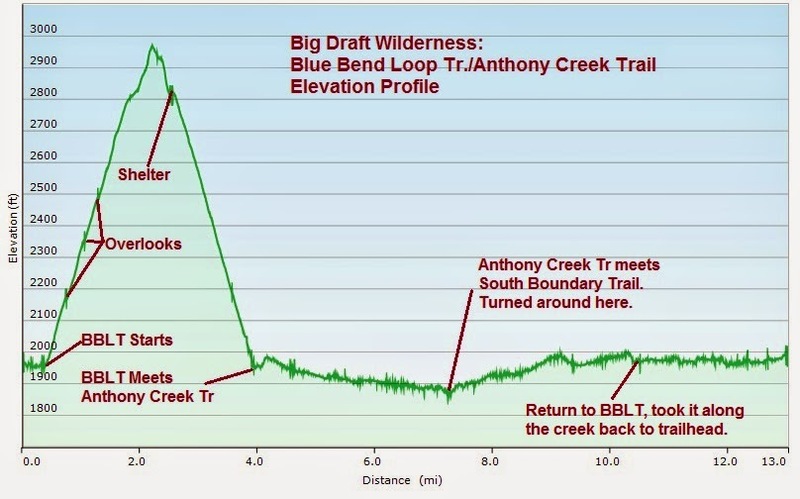 I did not find such a trail, and do not recommend the Anthony Creek Trail. Another Anthony Creek view, from the trail. and the South Boundary Trail on the right heads towards its trailhead on Big Draft Road. This is a typical campsite in the USFS Blue Bend Campground. It is probably site number 10, next to Anthony Creek. The hike started and ended at the Blue Bend Campground and Recreation Area. This is an exceptionally nice, wooded campground with 21 campsites along Anthony Creek. Nearby, Anthony Creek has a swimming beach. It is a popular fishing destination. There is a live campground host, flush toilets and warm showers (free to campers). While I wish there was an option for non-campers to use the showers, the campground makes a very nice base from which to explore the southern portions of Monongahela National Forest and/or bike the Greenbrier River Rail-Trail, about 4.5 miles away. There is an adjoining day use picnic area with free parking and pit toilets. The day use area is the jump off point for non-campers who want to hike these trails. There are also beaches along each side of Anthony Creek that are accessed from this parking lot. And the picnic area has a large, depression-era picnic shelter with an enormous stone fireplace. This can be rented - I think it said it cost $25 to reserve. That area could handle a very large group. The picnic Shelter at the Blue Bend Campground is huge and reservable. It is a similar design to the shelter at Sherando Lake in the GWNF. The fireplace in the shelter. Another area for groups is the nearby Blue Meadow Group Campground. It is about a quarter mile up the road and on the other side of the access road, which travels between Anthony Creek and the group campground. Group campers need to come down to the Blue Bend Campground to use showers. The Blue Meadow facility is reported to be more open than the wooded Blue Bend Campground, and better equipped for tents. As a side note, I was greatly assisted in my hike planning by my copy of the Monongahela National Forest Hiking Guide, written by Allen de Hart and Bruce Sundquist for the West Virginia Highlands Concervancy. There is now an 8th Edition (2006) available (link), though I used the 7th Edition (2001). These folks have been publishing these guides since 1972, and cover virtually every trail in the Monongahela National Forest. It is also available in CD format (Link) (Sample Chapter). I recommend it highly, even though it takes some getting used to at first - there are many abbreviations that require some decoding. You can see this in the sample chapter, linked above. But these authors really know their trails, and profits are plowed back into conservation efforts in the state. A win win.